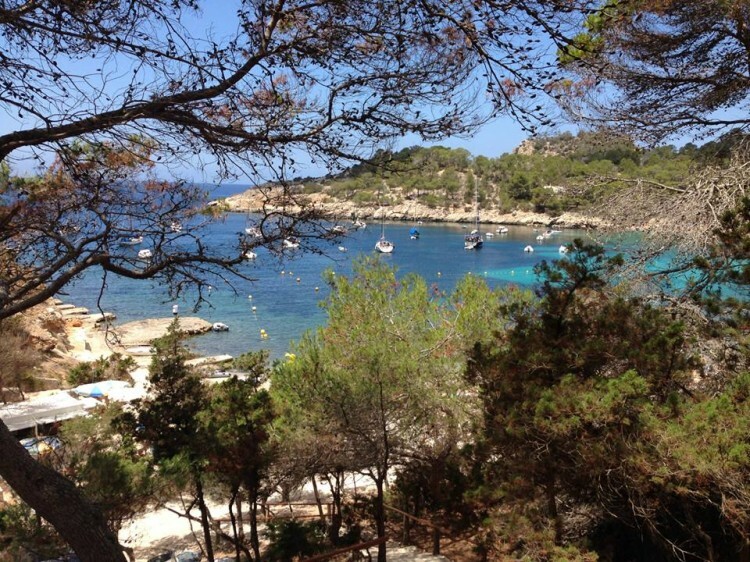 Are you by any chance heading to Ibiza for the closing parties? If you are, I’m beyond jealous. This season was my third on the White Isle and by far one of my favourites. A week was spent with twelve fantastic friends, in a melting pot of relaxation, fine dining, cocktail sipping and all night raving. There’s so much on offer that at times it can feel overwhelming. With so much to see and do, it’s hard to know which restaurant, club or bar truly is the best on the island, so I’ve compiled a list of some of my favourite spots to give you a hand if you venture to Ibiza this summer (or next). 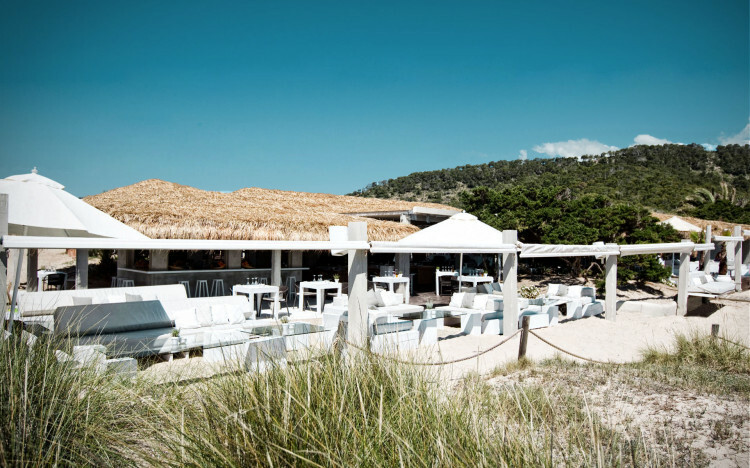 Head to Salinas and book yourself a bed in the sand at El Chiringuito beach club. The fresh juices and smoothies will cure even the nastiest of hangovers and the tuna burger is delish! The mood is laid back, but arrive early if you want a sun lounger with a sea view. It’s only a stones throw from the airport so if you’ve got a late flight, but an early check out, come here for the day and take advantage of the shower/changing facilities before flying home! Just around the bay from El Chiringuito is the Experimental Beach, which provides the perfect spot for sunset cocktail sipping prior to a delicious dinner on the sand. The DJ provides upbeat lounge music and the atmosphere is generally chilled, if you’re headed to DC10 one night for a bit of a rave, Experimental Beach is the perfect spot for some pre-party cocktails and food. On the subject of sunsets, the Cotton Beach Club provides one of the best on the island. 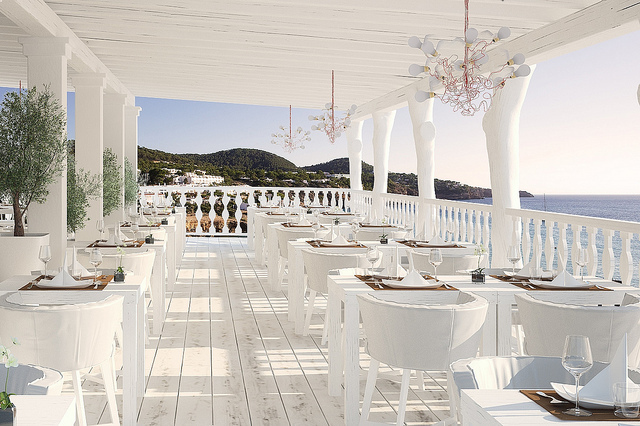 Newly opened, the beach club overlooking Cala Tarida, is a luxurious all-white restaurant, bar, private beach and club. The service really makes this place, with wonderful waiting staff, friendly massagers and accessible DJs – I loved it so much I went twice! The Giri Cafe in San Juan is the perfect place for lunch after strolling through the village’s Sunday hippie market. Rather unremarkable from the outside, the cafe is a delight once you venture in. Sit under a canopy in the garden and savour the locally sourced, seasonal dishes. 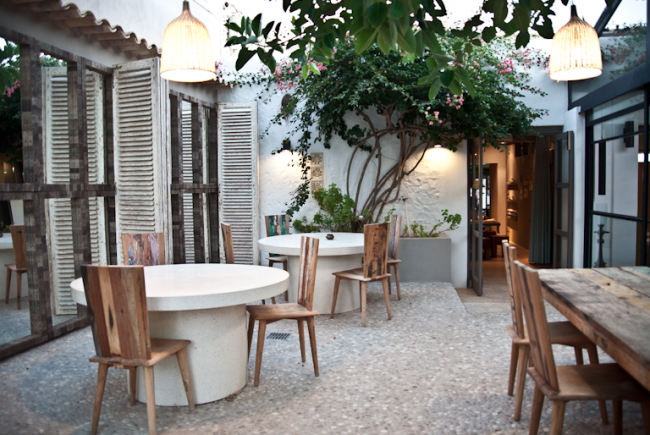 The most charming spot in all of Ibiza if you ask me – there’s no pretentiousness at all, just good food and an authenctic atmosphere. 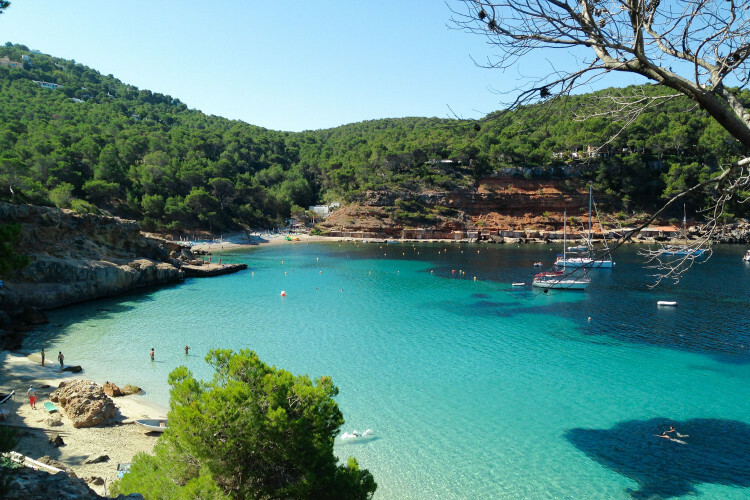 Cala Salada is what you see on the postcards, it’s breathtakingly beautiful and authentically Spanish. Recline on the rocks and spend a day lazing by the turquoise waters of this protected bay. 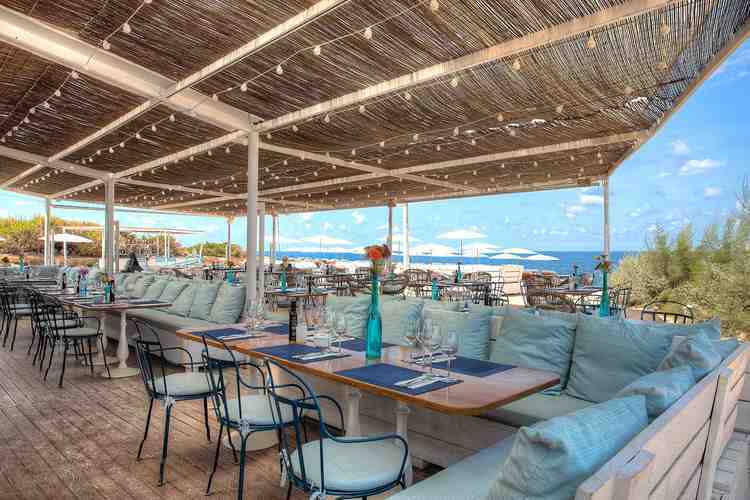 There’s a beach restaurant here, but this no frills Ibiza reserved for the locals. 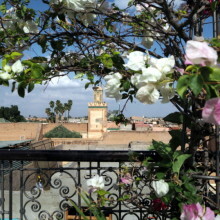 A refreshing take on the island and a wonderful way to spend one of your days. Every Tuesday morning at 9am to 10.30, Amante Beach Club hosts a yoga class with the most spectacular view out to the ocean. It was already 34*C when I took my class so the pace was very slow with a focus on breathing and relaxation rather than straining yourself – ideal for me who doesn’t know my namastes from my knee caps. 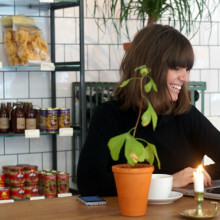 For €25 you get the yoga class and a delicious, healthy buffet breakfast. Of course there are no end of clubbing possibilities in Ibiza, with every music preference catered for. 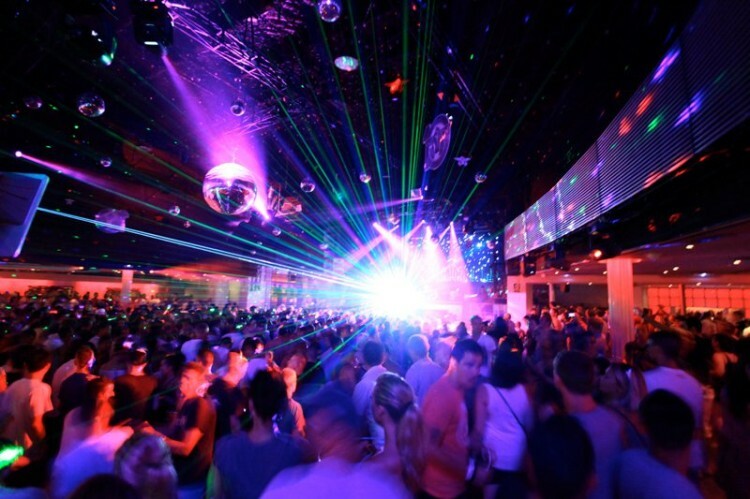 SPACE is the must-try Ibiza experience, with a mixed crowd of people filling the club’s multiple rooms. One of my favourite venues in Ibiza is DC10 – it’s as grimey as they come, with sweaty jam-packed rooms and a gritty vibe, but the music is awesome (if you’re into tech house/deep house that is). On the other end of the spectrum is the far posher Pacha – think happy go lucky DJs like Bob Sinclair and a swankier venue. If you want to get glammed up then Pacha is your spot. Out of all the day parties, Ushaia is probably the most popular, hosting resident DJs such as David Guetta and I am Hardwell. Grab your skimpiest bikini – and that applies to you too boys – and shake your stuff around the pool, it’s opposite SPACE if you want to continue the party after closing.